I love me some Taco Bell. Sadly, Taco Bell doesn't love me. In other words, it makes me poop. A bunch. But, its worth it, because Taco Bell has some of the best tasting stuff around. So every now and then, I gotta just bite the bullet for a quick cheap good meal. Taco Bell is always coming out with new items on their menu, constantly keeping it fresh without getting rid of some of its classics. They now have the Grilled Chicken Enchilada and this is an instant classic. This is probably one of the best items on the Taco Bell menu. The chicken and sauce with the rice and cheese is perfect. If you're a Bell fan, I highly suggest this. 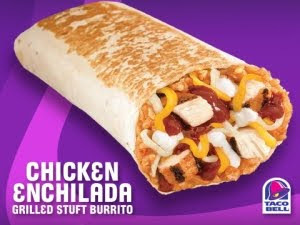 It is not the best item there, (nothing takes out the chipotle steak salad) but I will for sure be getting another one of these bad boys on my next Taco Bell visit. Had one of these tonight, I guess it's their new addition to the "Stuft" burritos, which is what I normally get. I enjoyed this one, and it's a little cheaper than the steak. I'd get it again for sure. Do you have to talk about shitting and food in the same paragraph? I know you are a jerk but even that has it's limits.